Flight Capacity Test addresses various pilot aptitudes from information perception and processing to divided - visual and aural - attention, short term memory, multi-tasking and stress tolerance. 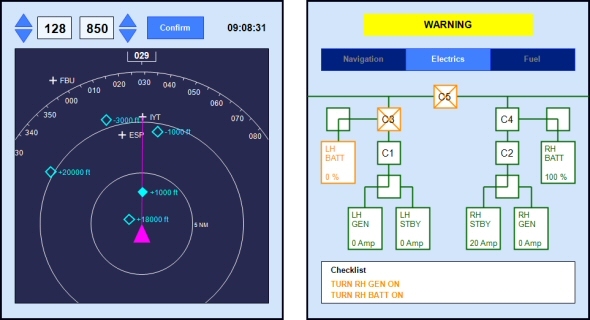 The task plots a flight deck situation with ATC instructions to apply and aircraft systems to handle, while remaining attentive to the live traffic environment around you. to apply. Along with this, you have to recognize and highlight evolving traffic conflicts on a TCAS screen. Two secondary tasks call attention to aircraft systems. You have apply updated settings to aircraft ELECTRICS and resolve FUEL pump failures.